« Melvins 30th Anniversary tour series! Formed in 1994, Altamont was started as a side project by Dale Crover of Melvins, along with Joey Osbourne of Acid King and Dan Southwick. This will be their first release since 2005 after having records previously released by Mans Ruin Records and AntAcidAudio. 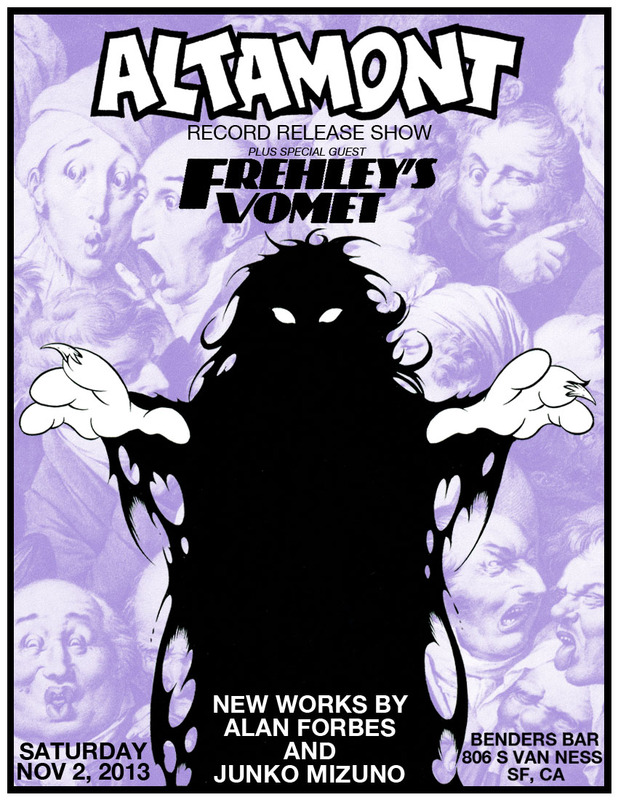 This release also includes Coady Willis (Melvins / Big Business) and Toshi Kasai to round out the band! As with all Valley King Records releases, the artwork is by Alan Forbes. The record packaging is silkscreened and signed & numbered by Forbes. Each single also comes with a vinyl sticker based on the cover art. In addition to the regular edition of 500 on black vinyl, we are releasing a very limited amount on colored vinyl! We are also making a very limited amount of shirts based on the cover art. The shirts will be American Apparel (or equivalent). Pre-orders are the only way to guarantee your size. Sorry, no womens shirts….mens sizes only (S-XXL). All shirts come with a vinyl sticker! This entry was posted on September 23, 2013 at 4:12 pm and is filed under Latest Additions, Music, Original Art, Shirts, Valley King Records with tags Altamont, Valley King Records. You can follow any responses to this entry through the RSS 2.0 feed. You can leave a response, or trackback from your own site.